“You can touch your nails now,” says Manami Ichibutsu as soon as she finished painting my nails. “Really?” I exclaim, incredulous. I’m the person who regularly smudges at least two fingernails five minutes after leaving a salon. But this time I’m at Studio L, and Ichibutsu, the owner of the Japanese nail salon, has just given me a manicure using Calgel instead of regular nail polish. As the name implies, Calgel is a gel. It is applied in the same manner as nail polish – base coat, two coats of color, topcoat – but without the pre-application soaking and buffing that cause polish to lift off the nail. Calgel is non-toxic and claims to strengthen the nail, providing nourishment that makes the nail more flexible. The product doesn’t chip or peel and lasts two to three weeks. Although I first heard of this type of gel only last year, Calbrook International, a South African company, developed it in 1981. After spreading to Europe, Calgel became popular in Japan six or seven years ago, and since then the Japanese have elevated the manicure to an art form. 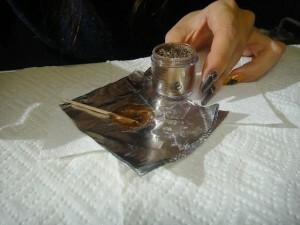 The Japanese love accessories, so they decorate fingernails rather than simply paint them. Calgel’s colors are pigments, which are mixed with the gel. “Some people want their own color,” says Ichibutsu, so she is able to customize the available colors to match her customers’ creativity. 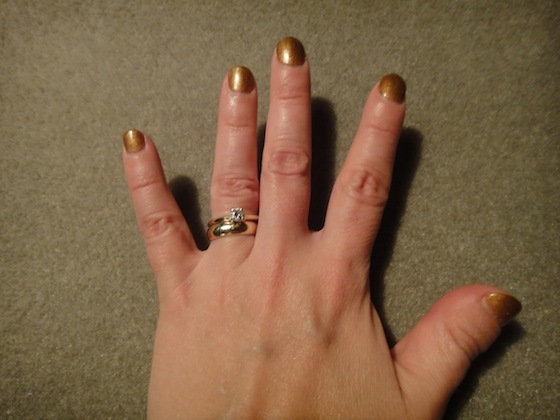 Calgel is slightly thicker than standard polish, but it dries quickly. Rather than painting one hand at a time, Ichibutsu paints the nails on both hands simultaneously, starting with the thumbs, then moving to the nails of the pinkies, ring fingers, and so on. While she paints a nail on the right hand, the left hand sits under an ultra-violet light to dry. This back-and-forth action eliminates the need to sit under an air dryer for fifteen minutes after the manicure is finished. And I could touch my nails, as Ichibutsu suggested, and not smudge them. 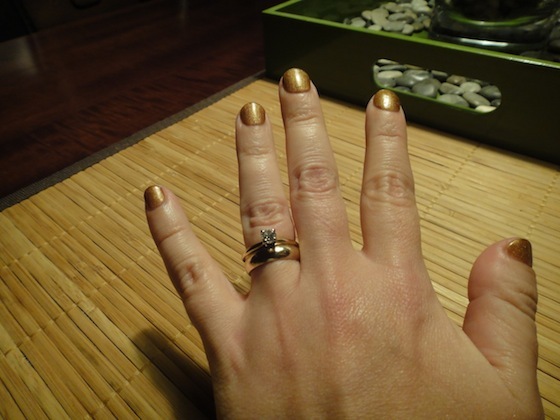 More than a week after I visited Studio L, my nails are still perfect; there is no scratching or peeling on any nail. You won’t stumble upon Studio L when you’re walking through the city, and there isn’t a giant neon sign pointing you toward it. That’s because the salon, which Ichibutsu opened in August, is located on the sixteenth floor of an office building in the middle of the Garment District. Although the hallway reminds me of my accountant’s office, the interior of Studio L has the feel of a traditional salon, albeit in a small space. Each of the four chairs in Studio L comes equipped with giant pillows that are comfortable to hug while sitting for more than an hour for a manicure. (A manicure with several colors and stones can take between 90 minutes to two hours.) Alligator-shaped pillows adorn the tables, offering a cheerful spot to rest your wrists. Samples of nail art and magazines about nail art line one wall. Two pedicure stations sit across the room, tucked in a cozy corner of the clean and tidy salon. For Ichibutsu, who has been in New York for eight years, Studio L is her first foray into ownership after working at another nail salon. She chose the name “Studio L” because “L stands for lucky, life, luxury, love . . . a lot of good things start with L,” she says. If you want to experiment with Japanese nail art, call for an appointment and head to the Garment District, where you’ll be lucky to have Studio L in your life for a luxurious manicure you’ll love. Studio L is located at 247 W. 38th Street (between 7th & 8th Avenues). Hours are Monday through Friday from 10:00 a.m. until 6:30 p.m. and Saturday from 10:00 a.m. until 4:00 p.m. Closed Sunday. To make an appointment, call 646.499.5357.